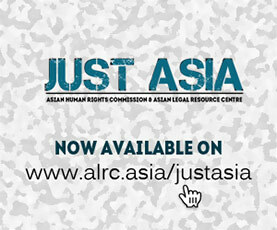 The Asian Human Rights Commission (AHRC) has received information from the Centre for Organisation Research & Education (CORE) on the exra-judicial killing of a 32-year old woman named Thangjam Manorama by the personnel of the paramilitary force 17 Assam Rifles on 11 July 2004. Her body was found at around 5:00 p.m in She was found at Keirao Wangkhem Road near Ngariyan Maring Village, after she was picked up by the armed forces in the early morning of July 11. When it was found, the body wore no proper clothes and Manoramasfamily believes that she had been raped and then killed by the army personnel. According to the report from CORE, curfew was imposed in Greater Imphal, Bishenpur and Thoubal Districts of Manipur, India since 15 July 2004 in wake of widespread public protests against the torture and extra-judicial execution of Manorama. Large number of people came out on the streets defying the curfew that caused street battles between the people and Manipur police. It was reported that over 100 people were injured in the police firing on July 16, while the police tried to disperse the people at various places including Kongba, Sangakpham, Tera, Uchekon and some on the outskirts of the state capital using tear gas and rubber bullets. Manipur state administration and the military agreed to inquire the case of Manorama. However, almost all judicial inquiries ordered in prior cases of arbitrary execution are pending disposal since the army was not cooperating and it is believed that this case also will not get justice. Your urgent action is required to pressure the government of India to take genuine action to correct this matter. A 32 year old woman named Thangjam Manorama alias Henthoi was brutally tortured and allegedly executed by personnel of the paramilitary force 17 Assam Rifles stationed in Manipur, after she was picked by them on the early hours of 11 July 2004. According to the victim’s family, troops of the 17 Assam Rifles along with two Manipuri speaking people came to their house in Bamon Kampu, Imphal East District around midnight (12:00 a.m.) of 11 July 2004 and they broke the door and entered the house. At that time Manorama was sleeping in her room. When the security personnel found her, they dragged her out from her bed and beat up the family members when they tried to stop them. Then they locked the house door from outside and brutally assaulted Manorama after blind folding her and tying her hand and feet. At around 3:30 a.m. of July 11, the security personnel took Manorama along with them. They issued a memo of arrest to the family. In the memo of arrest, Havildar, General Duty of the Assam Rifles Suresh Kumar (Army no. 173355) and Riflemen T. Lotha (Army no. 173916) and Ajit Singh (Army no. 173491) put their signatures as authority and witnesses. According to the memo of arrest, no incriminating documents or articles were found with Manorama at the time of her arrest. The army personnel also forced the family to sign on some papers that they do not know about. The army personnel told the family that Manorama would be handed over to the Irilbung police in the morning. A report filed at the Irilbung Police Station in the early morning of 11 July 2004 indicated that Manorama was taken by the Assam Rifles personnel. However, the bullet ridden body of Manorama was found at around 5:00 p.m. on 11 July 2004 by the villagers at Keirao Wangkhem Road near Ngariyan Maring Village, about four kilometers from the family’s house. When it was found, the body wore no proper clothes. The body reportedly bore finger-scratch marks were found all over the body and a gashing wound probably made by knife was found on her right thigh, too. Several fatal bullet wounds were seen on her back, the upper buttock and the genitalia. Manorama’s family strongly believes that she had been raped and then killed by the army personnel. A post-mortem on the victim’s body was conducted on July 11 at the Regional Institute of Medical Sciences, Imphal but the victim&#0;s family insisted that it was not conducted properly according to the guidelines laid down by the National Human Rights Commission. Until now, the family has been refusing to receive the body calling for proper and independent post-mortem and the victim’s body is still in the RIMS morgue. However, the official spokesman of 9 Sector Assam Rifles said on July 11 that Manorama was a member of the banned Peoples Liberation Army (PLA) and was shot dead when she tried to flee while leading the Assam Rifles to a PLA hide out. The spokesman contradicted the memo of arrest given to the victim’s mother saying that a wireless radio, a hand grenade and sheaf of incriminating documents were seized from Manorama at the time of her arrest. Curfew was imposed in Greater Imphal area and extended to Bishenpur and Thoubal Districts of Manipur, India since 11:00 a.m. on 15 July 2004 in wake of widespread public protests against the torture and extra-judicial execution of Manorama by personnel of the paramilitary force 17 Assam Rifles on 11 July 2004. However, again large number of people came out on the streets on July 15 defying the curfew that caused street battles between the people and Manipur police, Indian Reserve Battalion (IRB) and Central Reserve Police Force (CRPF) personnel. The eyewitness confirmed that uniformed and armed central security forces personnel were also dispatched in the curfew areas. The people including women continued to go out on the streets and joined the demonstration on 16 July 16-17 and over 100 people were injured in the police firing on July 16, while the police tried to disperse the people at various places including Kongba, Sangakpham, Tera, Uchekon and some on the outskirts of the state capital using tear gas and rubber bullets. The injured were rushed to the Jawaharlal Nehru Hospital and the Regional Institute of Medical Sciences hospital. Both the hospitals were packed with injured people and their relatives and friends. There was complete chaos in the hospitals as so many injured persons were brought in. In addition, many women’s organizations have taken up sit-in public protests all over Greater Imphal and Manipur, defying the indefinite curfew against the killing of Thangjam Manorama by the Assam Rifles and called for the Government to punish the perpetrators under the law and repeal the Armed Forces (Special Powers) Act 1958, which has given extra ordinary power to the army and paramilitary forces. After facing huge resistance of the people, the Chief Minister of Manipur, Okram Ibobi said on 16 July 2004 that the government would investigate this case and punish the Assam Rifles personnel involved in the killing of Manorama. Accordingly, Lt. Gen. Daljeet Singh, Corp Commander was summoned by the Chief Minister. The commanding officers of the 17 Assam Rifles were also instructed to hand over the three persons who had signed the memo of arrest for interrogation. The military though did not agree the incident in total, agreed to cooperate with a judicial inquiry. The perpetrators were kept away from duty until the completion of judicial inquiry which started on 12 July 2004. In this context it is also important to note that almost all judicial inquiries ordered in prior cases of arbitrary execution are pending disposal since the army was not cooperating and it is believed that this case also will face the same result. The inquiring body has been asked to submit its report within one month. As far as the legitimacy of the judicial inquiry is concerned according to the provisions of the Armed Forces (Special Powers) Act, unless there is a sanction from the Central Government, the judicial inquiry would not be of any use. As in this case the Central Government is yet to sanction for the judicial inquiry, in such a case the very purpose of judicial inquiry would be defeated and the chances are the military would not corporate at all with the current inquiry. The Armed Forces (Special Powers) Act 1958 is being continually extended in the whole State of Manipur since 1980. Under the illegal and unconstitutional provisions of this draconian Act, even the state police are now acting as if they are above the law. In addition to this draconian law, the application of Prevention of Terrorism Act worsen the situation there by giving absolute impunity to the acts of armed forces, para-military and police in the region and in particular the state of Manipur. The law enforcement agencies in the eastern states in India are enjoying the absolute impunity granted by the above laws since a long time. The brutality and torture of these agencies are continuing unchallenged on the excuse of these draconian laws. Even though there are some provisions incorporated in these laws on the pretext of proper implementation, any one who questions such acts of torture and brutality would be subjected to immediate torture and the perpetrators would escape unquestioned. This is yet another case reported from India on torture and execution by armed forces. AHRC urges the Indian authorities to take immediate steps to stop this brutality. We urgently call for disciplinary or legal action against the perpetrators. The Indian government must take firm actions to ensure that torture is not committed by any law enforcement agencies for any reasons, and that the officers responsible for such crimes are duly prosecuted and punished. India should take immediate steps to ratify the Convention against Torture and legislate upon it. Please send a letter, fax or email to the relevant authorities expressing your concern regarding this matter. I am shocked to hear about the murder of Thangjam Manorama alias Henthoi, Bamon Kampu, Imphal East District, Manipur from India. It is yet another glaring example of how draconian legislations and absolute failure of rule of law could create devastating effect upon the people of the country and yet the perpetrators could walk away free with complete impunity. I learn that Thangjam Manorama was tortured at her house during the early hours of 11 July by the perpetrators named above and later she was taken by them. Her body was later found bullet ridden and mutilated and the army officials now claim that she was shot dead when she tried to escape. The relatives claim that the victim was tortured at her residence, blindfolded and later taken into custody and since she was killed by the authorities they have registered a false case against her. I also understand that given the existing circumstances there is every likelihood that the perpetrators would escape any punishment for the act they have committed since the current inquiry commission is with very limited mandates which do not even have the approval of the central government. So also the draconian laws like the Armed Forces (Special Powers) Act which is been extended since 1980 and the Prevention of Terrorism Act should be called off immediately from being applied arbitrarily in India. I urge you to take immediate steps through your office so that the army would extend its complete support to the inquiry which is already in process and that the perpetrators be punished. I also urge you to take immediate steps so that the relatives of the victim is adequately compensated and to make the perpetrators pay the amount of compensation. Simultaneously India should ratify the Convention against Torture and should immediately implement domestic legislation to put an end to the arbitrary execution and torture by the law enforcement in India.